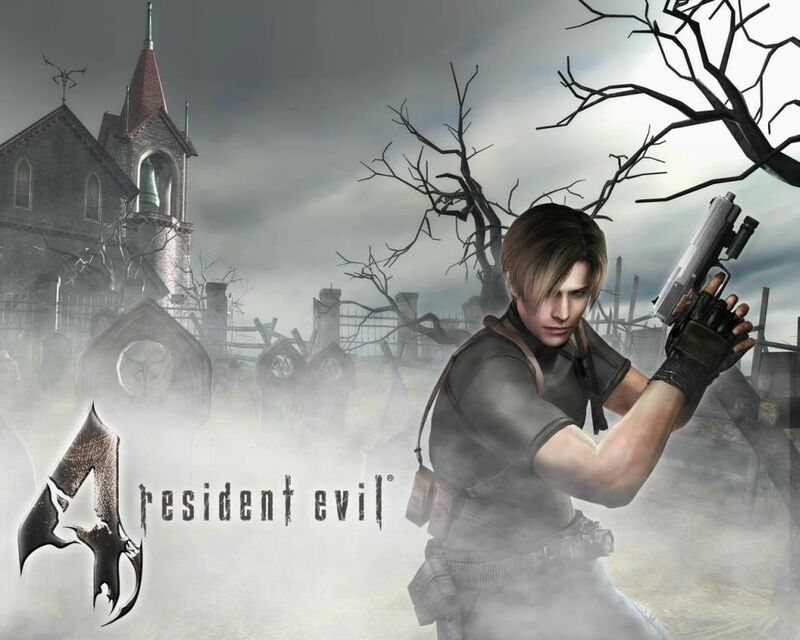 Resident Evil 4 came out in early 2005 and was available for the Nintendo Gamecube and the Playstation 2. Originally, the game was planned out to be very different that the final product we have today. 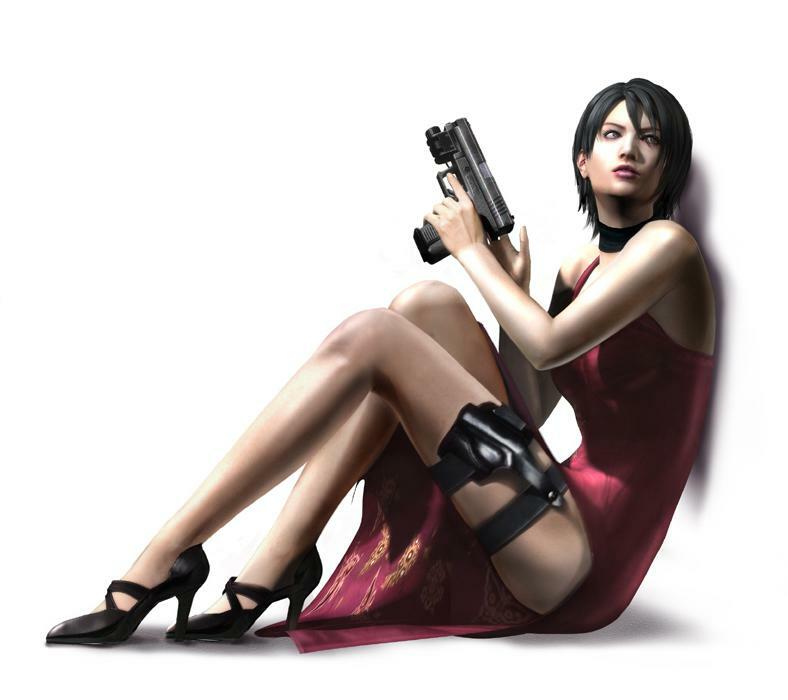 to begin with the game’s protagonist was basically Alice from the Resident Evil film series, practically immortal and given an array of superpowers thanks to the bio-engineered organism inside his body. Developers felt that the series traditional fixed camera and painted backdrops would taker players out of the action and opted for the game to have a more dynamic camera angle. The developers had a certain design style in mind too and geared all their progress towards that end, they were obsessed with ‘coolness’ and designing everything to that end. I, personally, think this is a terrible theme to build a game around, being nothing but a fast track to ridicule. Eventually the game ceased to be recognisable as a Resident Evil game and thus the developers decided to make the game into an original creation all its own; and thus Devil May Cry was born. The game went through several drastic changes while under development including being set in an Umbrella lab and being centred around a more paranormal story than the series usually bothers with. 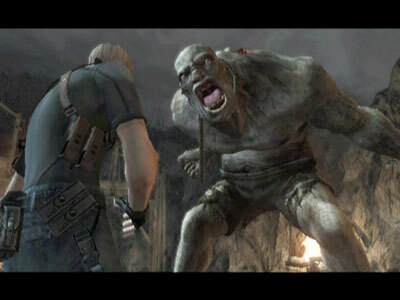 The only reoccurring themes was that the game’s hero; Leon was infected with something early in the game and had to fight for a cure. Eventually development settled down and the were given the game that is available to download today. 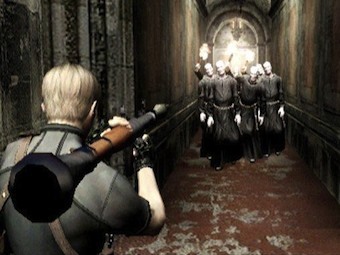 Resident Evil 4 moved away from being a traditional survival horror game and moved more towards an action game with horror elements woven in. While there were still scares in there, ammo would be plentiful if used in moderation and players would rarely find themselves defenseless. Gameplay was opted more towards gunfire and explosions rather than an actual scary experience. Wasn't this a game about zombies? This game actually seems to have very little to do with the other games in my opinion, the story follows the hero from Resident Evil 2, Leon Kennedy, to rural Spain as he is in search of the President’s daughter who has been kidnapped. Upon entering the small village he is immediately attacked and thus starts the fight to find Ashley and then escape. The player actually finds her pretty early on, but when they do, it’s only the very tip of the iceberg. Ashley is well-known as one of the most annoying support characters in current gaming and gets abducted almost as much as Princess Peach throughout. Each time Ashley is taken away, Leon must fight deeper into enemy lines to get her back. The majority of the enemies in the game arn’t zombies either, they’re insane cultists, it’s only when you start attacking them do their mysterious parasites come out to play. A huge mechanic in the game involves keeping Ashley close by, or at least hidden and not allowing her to die or get taken by one of the wandering enemies in-game. You could compare this to having a lead weight shackled to your ankle for the majority of the game, but in a way it works, it gives you extra reason to fear enemies, because if she dies, you fail. And besides, she isn’t that bad, she stays well out-of-the-way of fire and doesn’t waste your ammo. The game’s story seems very episodic, taking you from a twisted wooded area, to mountains, to a Gothic castle to a prison island. The transition between locations is so seamless that you’ll forget that you spent a whole section of the game in the woods. I can best describe this game as being split into stages, old school style, each section having it’s own boss. All the time you’re in the castle your being plagued and taunted by some little guy with a creepy voice, once he is dealt with, another henchmen suddenly shows up out of the blue and then he won’t leave you alone. This is drawn out to the point where the game is deceivingly long. I’ve played through this game more than once on more than one console, and every time I go back to it I forget how damn long it is. I think this boils down to the gameplay, it doesn’t vary all too much throughout, while there are plenty of action set pieces and variety of puzzles the game is utterly liner and you get shuffled through rooms so fast that you forgot they ever existed. By the end, rescuing the President’s Daughter seems like a more harrowing task than it first appeared, and with new story elements popping up well late into the game, well, I certainly can’t call it boring. Both versions of this game look really good. The original version on the Gamecube/PS2 was really quite impressive as were many games nearing the end of that console generation. The HD version looks even better, I know a lot of people are dismissive of the HD remakes that come out for games like this. Some would liken it to a graphics spray tan, merelty there to make it look browner. 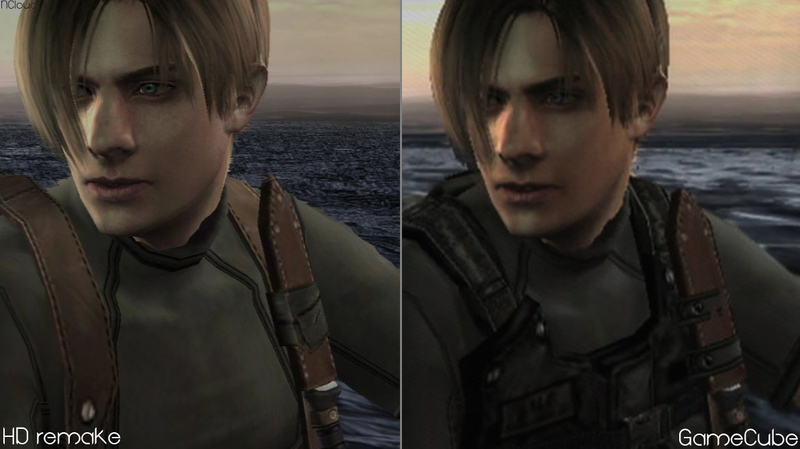 While brown is very much the favoured colour of the current console generation, the HD remake of Resident Evil 4 is most defiantly a good thing. Aside from smoothing out the graphics and making the environments much sharper, where they were blurry and blocky before, the game’s colours also seem much richer and the environments benefit from them greatly. The version of the game available to download greatly benefits from this ‘HD spray tan’, it brings the game up to date with current generation games and it doesn’t feel out-of-place in the current console generation. If there were one thing I could say to define the controls in Resident Evil 4, it’s that they certainly are… unique. At this moment in time, you go and pick up any first or third person shooter and chances are the controls are all pretty similar. Aside from a few different inputs for reloading and melee attacking, you’ll be able to just pick it up and play without any trouble. Resident Evil 4 has decided to have this thrown out of the window with an anvil tied to it and make up a new control scheme, screw what people may or may not be used to, they’ll do it their own way. Funnily enough though, it works. This game wants to be scary, it wants to induce panic and a sense of dread, when you round a corner and come face to face with an angry farmer wielding a pitchfork, the inability to remember how to aim and shoot at the guy can be pretty damn scary. It can sometimes be a problem that you feel like your wrestling with the controls, whether or not you want to say this is intentional is all up to you. The other big hot topic when it comes to this game is its quick time events. I do think it is overly reliant on them, even to the point that it includes them in cut scenes. Yep, that’s right, you can die during cut scenes. There is one particular scene where Leon is taking part in a knife fight and there are at least five of these within it, if you’re not on the ball, you’ll die. A lot. And there is no skipping the cut scenes either, it’s the instant gratification gamer’s worst nightmare. I say Kudos for doing something different, but add more variety than either ‘press both shoulder buttons’ or ‘press X and A’. There are a dozen little things I could talk about in this game, so many little things that make and sour the experience. The inventory for one. Instead of being in the form of a list or a grid, the player has an attaché case which they need to physically slot off their items into, each of them, sort of, being of a realistic size in comparison to one another. It makes managing your inventory interesting, hell, even reloading is satisfying, seeing Leon slotting bullets into the rifle or the mauser is weirdly enjoyable. The set pieces where you are trapped in a building and need to hold off a seemingly endless wave of enemies builds great tension and make for some of the best parts of the game. The game draws you in very early by having an entire village attack you and daring the player to survive the horde. The shame is that these moments of classic zombie horror greatness become far less frequent as the game goes on. Hell, the final hour of the game is almost unrecognisable when compared to the first. 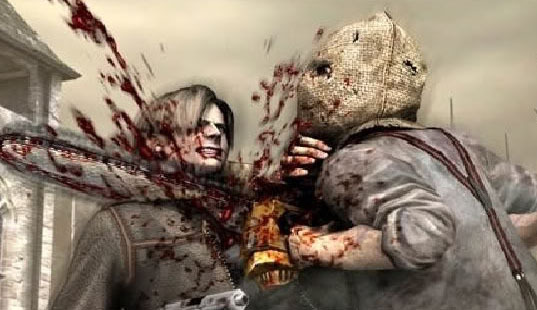 The biggest change Resident Evil 4 brought to the series upon it’s release was its change of focus from a straight up survival horror game to an action game with horror elements. Many traditionalists have been unhappy with these changes to the main game line, and this is part of the reason the series plans to return to it’s survival horror roots for Resident Evil: Revelations. However, in spite of people not being happy with the changes made for the game, it doesn’t mean the product delivered was still a hell of a satisfying experience. The majority of gameplay will have the player building up an arsenal of weaponry and upgrading their weapons as they collect money from all over the place. The most challenging thing about the game is using your ammunition in moderation. While most of the time you’ll have more bullets than you’ll ever need there are a few sections where it’s early enough in the game that you haven’t actually amassed loot to properly defend yourself or there are so many enemies that you use it all up. This game really teaches you the value of the headshot as you’ll be desperate to make every shot count. In a way though, this takes away a lot of what makes survival horror games scary. If the player is too well equipped to defend themselves, they’re not going to be apprehensive about opening that door, or climbing that ladder, if there is anything there, they’ll just unload two barrels into its skull. Who need to be scared of a giant newt when you have a mine launcher? Y'know, to this day I still have no idea why this woman was in the game. other than, y'know, legs. The game is still scary though, just in different, more mainstream Hollywood, ways. Overall, the game isn’t all that scary. There are some pretty good scares in the game and in parts it really does build a sense of dread and foreboding, the game is so long through that by the time your past the half way point you’ll feel like superman and will welcome all comers. That’s when the game ups the ante though and introduces enemies like the regenerators who can absorb every slug you’ve got and keep coming. People say that this isn’t a scary game, but I say that it is a very atmospheric game. I’ll admit that it gets very campy in parts, but that’s all part of it’s appeal. The original was great, the HD remake is arguably even better, with a few extra game modes to play upon completing the main story. I’ve poked holes and criticized, like I always do, but I really do like Resident Evil 4. It’s well worth the effort to pick a copy of the game up, and now with the HD versions available to download, there isn;t any excuse. The length of the campaign alone is worth the money, and with several unlockable modes available after completion, there is a ton of content up for grabs. I’ve you’ve never played a Resident Evil game before, this would be the one that I, personally, would recommend. It’s a ton of fun, it’s scary and it features the best Resident Evil hero to get his own equally cheesy and CGI movie. I don’t mean to be rude but you should run this through Microsoft Word and fix the spelling errors. For example at one point you spelled Resdient instead of Resident. Sorry I’m just a stickler for spelling but it is easy to make mistakes. Aside from that I did enjoy this review, keep up the good work! Yeah, sorry about that. I posted this pretty late and I’ll admit that I’m not the best at proof reading my own work, so there is a chance of that happening. I normally try to sit on a post for a day before I post it, but I wanted to get this on the sit within the night. Rub on the paste using a washcloth or just your palms. Being pampered and getting a spray tan is about feeling stylish and looking healthy. and moisturize before and after the tanning session respectively. dress & you could end up looking more orange than blushing bride. 1 – One real concern for pregnant women is that of becoming overheated or dehydrated while using a tanning bed. a mist tanning applicator, the tan is absolutely even across your body and does. many people seeking cosmetic surgery and there are many thousands of them who can afford it. it has yet to reach universal adoption. The final large expense SEO creates is tracking and analyzing data. goods for some limited time period. topicos que has redactado, si bien es cierto que no en la integridad. ﻿¿Por donde pudiese apreciar mas indicacion acerca ese fondo? resulting in an average loss of 1 pound per day. The convenience of these small pellets is what has them growing in popularity so quickly. so you never know what you get when you purchase these hormone drops online, says the News Junky Journal. Place the back of both wrists at the bottom of the chin. Those who want to get rid of such problems must have tried various anti-ageing products, but found no result. ﻿Me deleita abundantemente casi toda la info que escribes. ﻿Me fascina alo los ideas que posteas aqui, pese a ser el diseño y estilo del website resulta ser insulso. constipation, dysphagia, diarrhea, and irregular stools. hypothyroidism are subtle and gradual and may be mistaken for depression. and still has them in their person. For all these needs, the local locksmiths are sought after. Every equity release scheme contains some advantages and disadvantages. job in this part of the world. com makes sharing and access control easy ‘ files or folders or even file drawers. Interviews of defense professionals, merged with your data. Have you been seriously thinking on the benefits of – There are many benefits which you would come across when you hire the services of LA Movers for transferring your household goods to Los Angeles.